If you got summer on your mind, so does the township. The 2018 beach and pool badge information was released today, and Toms River now has them available for sale. There’s no change in pricing over last year. Here are the details: Starting today, April 2, grab a full-season beach badge for $35. That’s the pre-season price for a beach badge to use the township’s beaches at Ortley Beach, northern beaches and Shelter Cove. Get your passes before the beaches open and are guarded, starting Saturday May 26, which is Memorial Day Weekend. 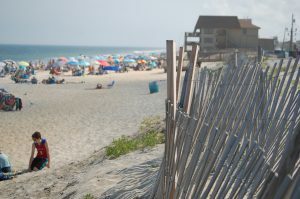 From Memorial Day Weekend through June 22, the beaches will only be guarded on the weekends. On June 23, the beach is open daily through Labor Day, when it reverts to weekends only for a couple weeks thereafter. Beach hours are 9 a.m. to 5 p.m. Besides a season badge, you can also buy a weekly badge for $20, and a week is defined by Saturday to Friday. Daily beach badges are $7, unless it is a weekend or a holiday and then it is $8. There is no cost for beach badges if the child is 12 years old or younger. Senior residents can sign up for a “lifetime access card,” which will grant you access to the beaches, for a one-time processing fee of $15. Beachgoers should note that the Army Corps of Engineers’ beach replenishment project is again expected to close a portion of the barrier island beaches at a time, as crews dredge to build dunes there. The tentative schedule is for that work to begin sometime in May for the Ortley Beach section. There’s also the popular municipal pool, located at the Toms River recreation department at 1810 Warren Point Road. The pool is scheduled to open for the weekend, June 16 and 17. Come Friday, June 22, the pool will be opened daily. Hours will be 11 a.m. to 7 p.m. Monday through Friday and 10 a.m. to 7 p.m. weekends and holidays. $75 for a resident who is 62 or older, or 4 to 12 years old. Free for children 3 years or younger. You could also buy a daily badge for the pool, with prices ranging from $5 to $8 depending on residency and age. The township also offers swim lessons at the pool, which are $45 for each lesson. Pool and beach badges can be bought at the recreation building. You could head to the Senior Center, 652 Garfield Avenue, to buy a beach badge too. Hours for each are 9 a.m. to 4 p.m.